If you’ve spent any time looking through our interactive map of the Washington Park Arboretum, you’ve probably noticed those purple plant dots. While most of the dots denoting different plants in the collection are bright Kelly green, some of them are a festive light purple color. But why? I stumbled on this question while trying to identify a tree that I had taken a picture of when I was wandering through the arboretum a couple weeks ago. 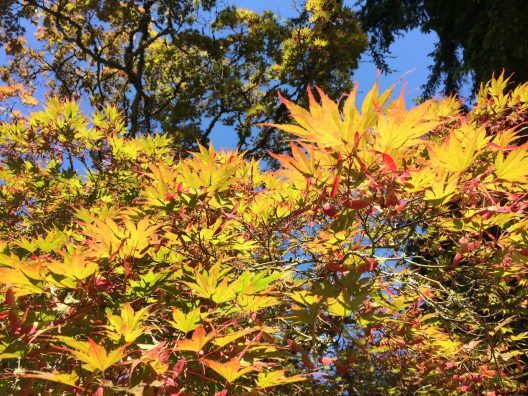 I now know that it is a Japanese maple (Acer palmatum), but having very little background in plants, the map has been incredibly helpful as I try to learn more about what I am looking at. My tree just so happened to be one of those purple dots. I clicked over to the legend and found no answers there. I immediately began looking through other purple dots, searching for some common characteristics to connect all the plants. I started clicking on random green dots, seeing if anything that came up was common between those plants, but different from the purple plants. The records that include pictures? The plants that don’t have an accession year? Nothing was lining up. It made perfect sense – no individual quality or information was connecting the variety of plants. The mystery was solved and I felt good, especially in knowing that one of the plants that stood out to me had done the same for the curator. But then I began to wonder why again. Why was that tree picked over its neighbors? What stood out to him about that tree, or any other favorite plant, that it was singled out? This time, I knew exactly who to ask to answer my question. Of course I had to ask about my Japanese maple that started these questions. Ray likes the tree “because it is especially prominent and has consistently good fall color and a nice form.” As far as I’m concerned, its early summer leaves look great against a bright blue sky. Now I’m looking forward to seeing what it looks like in the fall. Ray also likes to make sure that there’s at least one favorite in a given area, but acknowledges that’s not necessarily the case yet. “There are many good plants still to highlight and I haven’t spent as much time in the south and west ends of the arboretum,” he admits. With a desk at the Center for Urban Horticulture, I don’t get over to the arboretum as much as I’d like, but I definitely know what plants I will be checking out during my next visit.